I recently had the chance to do an interview with the founders of the YCombinator backed startup, WakeMate. WakeMake wants to help you sleep better by tracking your sleep. In this interview we talk about how they came up with the idea, how they gained traction, and their experience with YCombinator. I’ve also included a summary below the video. 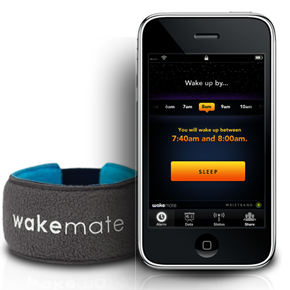 WakeMate is a cellphone accessory that tracks your sleep cycle, and helps you improve your quality of sleep. • Idea came from an experience 6 years ago when they realized they didn’t always feel refreshed in the morning when they woke up. • They’ve done a ton thinking and research. What helped to set you apart? • We had already built a prototype. • Proved that we were determined (both had dropped out of school at this point to work on WakeMate). • The YCombinator Brand. This opened a lot of doors. • Direct Access to Paul Graham. You have a lot of people giving you advice and it helps to have just one voice to focus on. • Don’t let not getting into YCombinator hurt you. There are many successful startups that have nothing to do with YC. • Focus on building a business. Statistically you’re not going to get into YC, but that shouldn’t stop you from building an awesome startup. • Advance your startup, and don’t worry about getting into YCombinator. Focus on building a business. How did WakeMate gain traction? • WakeMate solves a problem that is easily communicable. The best salesman you have is a customer who loves your product. How do you move from early adopters into the mainstream? • Talk to everybody. You need to gather research. • You need to be an expert in your field so keep learning. • Focus on your elevator pitch. Figure out how to comunicate your business in 30 seconds. Previous Previous post: Turbulence and the Start Up Bubble- “If you freak out, I’ll freak out”. Next Next post: Let your community grow alongside you: Ship unfinished apps.